"Them ol' thoughts're only in yer head." A stagnant pool half-fills the basin scooped out of sterile red talus and gravel beneath Red Rock Mountain. No outlet stream. No inlet. The corrosive water seeps slowly into the ground, exposing black boulders around its edge like stumps of rotten teeth. The shore teems with horse packers and Sierra-clubbers spewing babble and manure. That is how we remembered Landers Lake. So why would we want to return? Because the high country opened late in 2005. According to the ranger in Weaverville, snow blocked the high trails and the upper lakes were still half-frozen. The Ward Lake trail was still closed in July, but the Landers Lake trail, being more exposed, thawed earlier. We might be able to make it there. And even if we could not, the Swift Creek trail was open to Mumford Meadow. At least we could go that far. And because there was something haunting and other-worldly about the rusty rock and twisted, stunted conifers which clung to the impoverished ultramafic soil of Red Rock Mountain. We wanted to spend a night there, and perhaps this time have the lake to ourselves. And because we wanted to complete a circle. 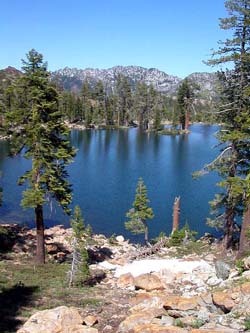 Landers Lake is perched on the divide between Union Creek and Swift Creek. We wanted to tie together our 1995 expedition up Swift Creek, including a dayhike to Landers Lake, with our 2004 trip to Foster Lake and out Union Creek. From above Foster we had seen Landers Lake glittering beneath Red Rock Mountain, and it was time to look back the other way. Then we might finally know Where We Were. 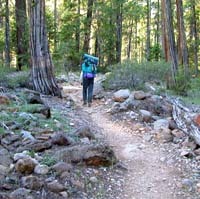 Monday, July 11, 2005, we set out for the trailhead from our cabin in southern Oregon. No one seemed to know whether the Parks Creek Road was still closed by snow, so we left Interstate 5 at Yreka, crossed Scott Mountain on Highway 3, and caught the Swift Creek Road at Trinity Center. We parked the van in the old, lower parking area beside a massive truck and horse trailer and, at 4000 feet elevation, stepped out into the blinding sun, straw, and horse manure. Sweating, we walked up the road to the upper parking lot with its shining new pit toilets and overflow of trucks and cars and horse trailers. This would not be a quest for solitude. In the evening we explored the foot trail from the lower lot, which climbed along the cool pools of a creek and blooming azaleas through a forest of incense cedars, Douglas fir, Jeffrey and Ponderosa pines. The foot trail joined the new trail from the upper parking lot just before the wilderness boundary sign. That evening we packed for the trip, so we could get a start before the heat of the next day. Cars came and went, but no one turned in to bother us. Tuesday we were up and on the trail by 7:45 am. What a fine hike it was climbing along Swift Creek in the cool of the morning! And how remarkable the landscape! Stout Ponderosa pine and Douglas fir towered around us, but not so thickly as to block our view of the peculiar red rock slopes and huckleberry oak climbing toward a pure blue storybook sky. Underlying the Swift Creek canyon is a vast sheet of ultramafic bedrock from the trailhead to the summit of Red Rock Mountain at 7800-feet,. This is remarkable not so much because the peridotite ascends so high, but that it had emerged at all into the light of day. High in iron and magnesium content, the rock is heavy and dense, and should have stayed deep in the upper mantle, whence it came. But somehow convective currents in the roiling magma brought it up to seep out and congeal like blood clotting from a cut where the thin sea floor spread at a ridge thousands of feet beneath the ocean's surface. Ordinarily this heavy sea floor rock would be the first to be subducted back beneath the North American Plate, never to see the open air, but further tectonic slight-of-hand managed to break off this massive section of sea floor, this ophiolite, then scrape it off on the edge of the North American Plate and jam it upward with the granites and diorites, the gabbros and basalts, the schists and the sediments, in the process of building the towering Trinity Alps. The result was an other-worldly landscape through which we hiked like ants atop a fallen gravestone. In a mile or so we came to the Swift Creek gorge, carved 90 feet deep into the peridotite bedrock. A by-pass trail for stock switched back and climbed higher up the slope to avoid the precipice. The gorge was spectacular. 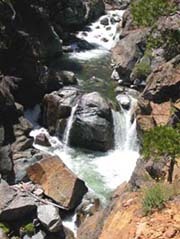 Swift Creek cascaded down between narrow rock walls and at the bottom was cleft into three streams on the anvil of a low mid-stream boulder. It brought to mind the surreal artistic visions of painter Bill Martin. As we left the gorge and continued to climb, we encountered meadowy and forested flats and benches above the creek. The soils were shallow, and the underlying iron-rich rock less nourishing than the granites we were accustomed to. Exposed to the open air and 40-inches of annual rain, this peridotite slowly metamorphozed into serpentine, which supported an entirely unusual flora. We hiked past boggy wet meadows full of Darlingtonia, or California Cobra Plants, whose lurid green horns rose like scuppers from the decks of tiny ships, enticing insects inside to be trapped and digested. "Not a good place to camp," I suggested. "No," Barbara agreed, "not a bit." Sleeping near these plants seemed unwise, we agreed as we lumbered past, lest in the blackness of the moonless night we might hear, too late, the squeaking, slithering, sucking of their carnivorous approach. In two miles we began climbing steeply up the right-hand slope, high above the footbridge crossing Swift Creek to the Granite Lake trail. Granite Lake was fashionable, and most of the vehicles we had seen at the trailhead had probable brought hikers bound for that destination. 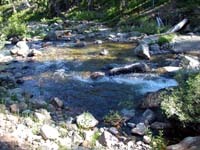 We saw an abundance of fine campsites along the creek well off the trail. At Steer Creek we put on our wading shoes to cross. The cold water was refreshing. On the other side we waved to a group of a dozen youths camped on a rocky knoll who were putting together daypacks and getting ready to move out. At Parker Creek another large group was camped near its rocky confluence with Swift Creek. We wanted to keep ahead of the other groups, but at the Parker Creek crossing we were overtaken. One by one the boys and girls of the Steer Creek group edged past us as we perched on rocks to strip off our hiking boots and tie on our water shoes for the crossing. Just as the leader entered the water, a man and woman with three llamas dropped down the bank on the other side. With some difficulty, they reined their exotic animals back up and off the trail, while the young hikers dawdled across. As we waited our turn ankle deep in the swift water, the Parker Creek youth group, and then a third group of young hikers, plunged into the stream, boulder hopping, thrashing, and splashing across. We signaled the llama people to go ahead and cross, and the woman did so with the first animal, but the man signaled for us to cross next. Using our sticks for balance, we waded the stream, then had to squeeze past the two spitting, groaning llamas waiting beside the trail. The whole process was like waiting for a delayed flight in the teeming aisles of a congested airport. Beyond the crossing the Parker Creek trail branched off to the right to climb over to Union Creek, and the Bear Basin trail branched left to cross Swift Creek on a foot bridge. Our trail moderated as it followed Swift Creek's meander beside Parker Meadow. We chatted with the pleasant young woman leading the youth group we had seen camped at Steer Creek. They were based in Redding. As they hiked, she pointed out a patch of Darlingtonia and other items of interest to the group. I am conflicted about youth groups in the wilderness. On the positive side, I support the notion of educating the younger generations about the splendors and values of the wild and respect for the untouched. On the other hand, I prefer not to run into them. We had encountered so many different groups over the years, and some were managed better than others. The best was a group we had seen at Meteor Lake in the Marble Mountain Wilderness, filing silently to the shore for water. 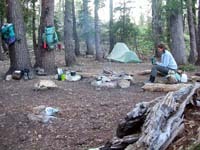 They had cross-countried off-trail to the lake and avoided developed campsites and other campers. The leaders maintained firm control and strict rules, included long periods of absolute silence. When they slipped away into the twilight, we never heard nor saw them again. Boy Scouts were the worst. They do not honor silence and have no merit badge for Respecting the Solitude of Others. Two rowdy troops had once ruined our long hike into Ukonom Lake in the Marbles. The little bastards were completely out of control and infested the entire lake basin like some unruly fraternity bash. The good-ol'-boy Scout Masters goaded their charges into shouting and whooping it up and playing cruel tricks on each other. "This is how we've always done it," they yucked. "Ho ho." Over the years we had also encountered silent juvenile delinquents housed beneath simple blue tarps above Mumford Meadow, a straggling line of brooding, youthful convicts on the Sandy Ridge Trail, whose guards cautioned us not to tell anyone how to escape, and at Patterson Lake in the South Warner Wilderness, a narcissisticly preening horde of teens with a ukelele from Mountain Meadow Ranch in Susanville. My solution is simple. I would require all youth groups larger than four persons to register on the Internet and disclose their itineraries. Especially the Boy Scouts. It would be like some mediaeval mark on the front door of plague victims. Trekkers seeking peace and quiet could avoid them. The Swift Creek groups were not so bad. The young boys and girls seemed intelligent, inquisitive, quiet, and, best of all, were only day-hiking from their base camps at Parker Creek. Wherever they might wander, they would need to return to camp by nightfall. 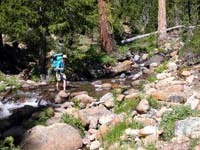 Muddy seeps and rivulets crossed the trail as it rose gently between Swift Creek and the wide expanse of Parker Meadow. Lime-green serpentine glistened in the exposed rocks, supporting patches of Darlingtonia in the boggy grass. A young backpacker coming the other way greeted us. "Do you have your wilderness permits?" he asked. "Yes," I replied, examining the young fellow more closely. He was short and wore a scruffy little red goatee. Missing from his backpack was a skate board. On his T-shirt was emblazoned a small "U. S. F. S." emblem. "Are you a ranger?" "No, I'm just volunteering." He was helping with trail work and hoped maybe next year to get hired on. "If they have the funding." I nodded. "Our permit's in my pack. Do you want to see it?" "No, that's fine," he said, waving the notion away. "Say, do you happen to know if we can make it up to Landers Lake? Is there still snow on the trail?" "No, not much. I'm coming down from Landers. Camped there last night. That where you're headed?" "Maybe, if snow's not a problem. Anybody else camped there?" "Couple of other groups. One with horses, but I think they were headed out." We chatted a bit more, shifting our packs to more bearable tensions. We had climbed over a thousand feet in five or six miles, and were growing weary. Soon the young man continued on his way down Swift Creek. Historical Foster's Cabin was supposed to be situated at the end of Parker Meadow. We had entered its coordinates from the DeLorme Map into the GPS. We passed the spot where it should have been. No Foster's Cabin. Irritable and overdue for lunch, we plodded on another grueling half-mile with no cabin in sight, then paused to inspect a small campsite in a clump of trees just below the trail. The boys and girls from Redding overtook us again. We asked the leader if she knew where Foster's Cabin was. She pulled out her map and studied it. "Should be around here somewhere." As they pranced on ahead, we asked that someone holler if they saw the cabin. A minute later, we heard a yell. In a grove of firs above the trail, lying between two streams just above Parker Meadow, we soon spotted the restored log cabin. Foster Cabin offered a campsite at 5380 feet. Darlingtonia grew in the meadow beside one of the rivulets. We dropped our packs by the front door. The afternoon had grown hot, and neither of us wanted to hike further. Sitting on the front stoop, we ate lunch and considered our options. The cabin was unlocked, and inside iron bunks offered shelter from the storm. But the weather was fine, and we were not inclined to sojourn amid the rust, dust, deer mouse droppings, and Hanta virus. A better campsite lay down alongside the trail beside a small ancient barn, propped up with diagonal logs, but listing dangerously. But with so many sightseeing youth groups, it would offer no privacy. We elected instead to scramble down the steep slope below the barn, squish across a grassy bog, and set up camp at a secluded site on the bank of Swift Creek. I wrestled the stiff current and slick rocks for a swim in a turbulent river hole. Barbara splashed water on her head and washed some clothes. Screened by the brush, shaded by the trees, and with a belly full of amaretto, we found peace on the rocky shore beside the rushing water. After dinner, we were too tired to explore. A young deer wandered into camp to see what was up. The bugs were not bad until dusk, and by then it was time to crawl into the tent and sleep. Wednesday we awoke with first light. Swift Creek funneled cold air into our camp from the snowfields above. The thermometer hovered at 42 degrees. My sleeping bag, which I had uncharacteristically zipped up during the night, lay limp with perspiration, so I turned it inside out and laid it in the feeble morning rays while we drank our tea and mocha beside the tumbling water. After oatmeal and dried fruit, we broke camp and were on the trail by 8:30. The trail climbed gently along the north bank of Swift Creek for about a mile before we came to Lander's Creek tumbling down from the red-rock cliffs to the north. We changed into our water shoes for the crossing and splashed up the bank on the far side. This marked the beginning of Mumford Meadow, where we had camped years before. In a hundred yards we came to the junction with the Landers Creek trail. Rather than following the creek, the trail cut across the eastern end of the Mumford Meadow and climbed steeply up the wooded slope beyond. After a mile of steep switchbacks, we returned to Landers Creek at a crossing just below its confluence with Sunrise Creek, where the Sunrise Basin trail climbed west to a 7400-foot pass before dropping into the Salmon River drainage on its way to Big Flat. One day we hope to take that hike. We changed into our water shoes for the crossing, then continued north on the east side of Landers Creek, climbing a red rock moraine dominated by rough chunks of peridotite of all sizes. Here we no longer found the rounded granite rocks that littered Swift Creek. Talus tumbled down from the rusty slopes to the west. Moraines and other glacial deposits filled the canyon bottoms. We came to a series of broad benches where the creek meandered through wet, sunny meadows with frequent patches of Darlingtonia. Between the lush green meadows, we climbed steep slopes where a sparse, stunted forest did a poor job covering the ultramafic soil. We stopped for an early lunch at some half-buried boulders in a steep meadow. Across the valley to the south rose the snowy peaks above Bear Basin. Above us Landers Creek cascaded down a rocky chute to disappear into the pools and meanders of the meadow. A quarter mile after our lunch stop we crested a rise and found another wide, wet meadow. A trail junction sign near a grove of mature foxtail pines pointed to two trails split by a rocky cleaver. The right hand branch continued north over the divide and into Union Creek. The Landers Lake trail cut left, finally beginning its slow westward arc toward the imposing shattered east face of Red Rock Mountain. Before long we were climbing switchbacks up the final steep grassy slopes into the lake basin. Landers Lake was vivid, dynamic, and spectacular, not at all as we had remembered. Snow clung to the jagged cliffs of Red Rock Mountain, which rose almost vertically from the steel blue water. The lake was full and spilled over the western rim to cascade down Landers Creek. The glacial valley tilting upward to the north and west contained a broad green meadow, down which poured a substantial inlet stream of meltwater from the snow fields blanketing the upper slopes. It appeared we were alone. As we followed the trail around the north shore of the lake, we crossed our first and only patch of snow, a paltry, slushy thing a yard wide and mere inches high. Ahead the well-worn path led into a grove of stately trees on a flat above the lake, where we expected to find the basin's main campsite. As we entered the grove, however, we saw two small tents. A compact young man with short hair wearing a bright yellow parka sat near them on a log. Tired, yet determined, we marched up to him and inquired whether he was planning to stay the night. In passably good English, he informed us that he and his buddy were Czech, and that they were hiking their way across America. As a matter of fact, they were just getting ready to pack up and hike out to Big Flat via Sunrise Basin. They had come over through Bullard's Basin and Union Creek and wanted to complete the loop. I was so elated, I wanted to share the wonder of Darlingtonia and what to look for on their hike out. But neither "pitcher" nor "cobra" appeared to be in the Czech's vocabulary, and my inept scratching with a stick in the duff was utterly feckless. Frustrated and embarrassed by our inability to communicate, we bid him farewell and hopped across the inlet stream to another campsite still half-buried in snow. There we ate lunch, then explored the vicinity, all the while keeping an eye on our prime accommodation and awaiting its vacancy. Within the hour, we observed the two brightly attired Czechs, hunched beneath robust backpacks, file silently down the trail. As we set up camp, the lower end of the lake was invaded by one of the older youth groups we had encountered on the trail the previous day. Shouting and splashing, they swam out to the little island near the outlet stream. The sun was bright and the afternoon hot, so they managed to endure the cold water for a very long time. Finally, late in the afternoon, they packed up and left us alone in the incredibly beautiful place. Just as we had hoped and dreamed, but dared not expect. After dinner we explored the upper meadow a little, then sat around a fire before crawling into our tent. Thursday morning, awakening alone in the primordial glacial cirque at the top of the world, ten miles from the trailhead and 7100 feet above sea level, we took our time and celebrated our good fortune. Despite the cold breeze down the meadow, the thermometer had not dropped below 55 degrees in the night, a fine temperature for sound sleeping. Overhead was deep blue sky. Our fortress was snow-clad red and green rock cradling Landers Lake, our ramparts foxtail and whitebark pines, red and white firs, our garden manzanita, corn lilies, and phlox. To amuse us were leopard frogs, chickadees, juncos, and robins. A few mosquitos and black bugs nipped at us until the day warmed, but they merely added spice. Leisurely we whiled away the morning swaying in our hammocks. 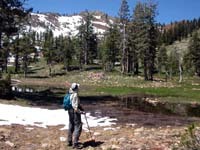 In the hot sun, beneath a cloudless sky, we wandered the upper meadows beside a few ponds to the low ridge forming the northern rim of the basin. The crest was less than 100 feet above us. 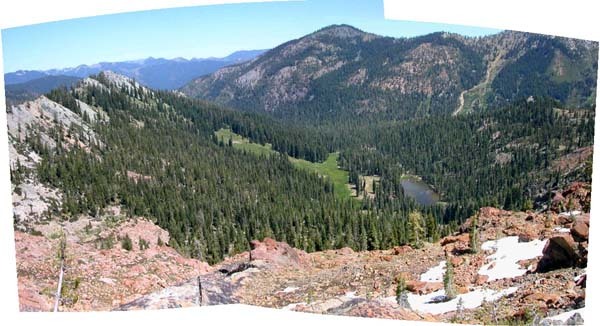 From a rocky perch atop the ridge, we ate lunch and gazed over the entire Union Creek Valley. Union Lake squatted green and shallow a thousand feet below and maybe a half mile away. The eastern headwall of the great valley was a massive plug of white granite, from Battle Mountain and Sugar Pine Butte in the north to Thumb Rock further south. Just below Sugar Pine Butte we picked out the slickrock ledge above Foster Lake where we had sat a year ago gazing back at Red Rock Mountain and sparkling Landers Lake. We traced the path we had descended into the verdant meadow at the head of the valley and the curving trail we had followed along Union Creek, past Bullard's Basin, and north out to Coffee Creek Road. Beyond the valley to the northwest we identified Packer's Peak and far off on the horizon what we thought must be Russian Peak. Small world. The wind came up in the afternoon to blow away the bugs as we explored the vacant basin. We climbed a little way up the slope to the steep headwall above the lake for a different perspective. Then we strolled up the north slope of the meadow, crossed the inlet stream, and explored several more small ponds in the upper basin. We found no campsites there. Yellow-rumped warblers and mountain chickadee chattered as they kept us company. After dinner we walked down to the campsite beside the lake. Most of the snow blanketing the site when we arrived had melted. The campsite looked like a fine alternative right beside the water. Then we hiked over to the outlet stream, sat on rough red boulders, and watched the shadows begin to stretch out over the valley below. All day long we had the basin to ourselves. Friday morning we celebrated out nineteenth anniversary of backpacking together. Happy backpacking to us! We enjoyed a leisurely morning and a late start packing up. Still no one arrived to crowd us. We planned to camp that night somewhere along Swift Creek and hike out the following day. Again we descended the sparsely forested grasslands, past the trail junction with the Union Creek trail, and through the three big meadows, beautiful, lush, and boggy, with Darlingtonia everywhere. Then the trail dropped steeply through increasingly dense forest to the Lander's Creek crossing, just below the confluence with Sunrise Creek and trail junction. By the time we arrived at Mumford Meadow, the heat of the afternoon had sapped our strength. 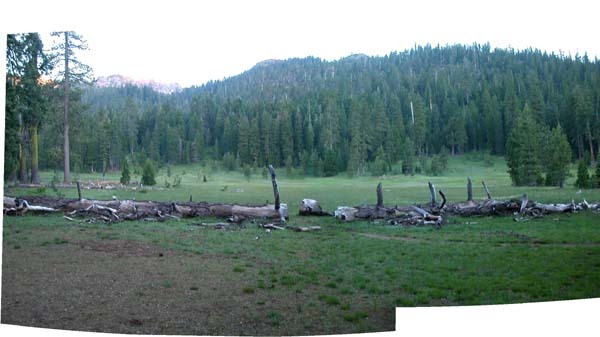 We left the trail to check out a large, empty horse camp at the east end of meadow. It was dry and dusty, with mounds of rotting manure, and far from the ready water supply of either Landers or Swift Creeks. But the view up the meadow toward Horseshoe and Ward Lakes was splendid. Barbara liked the site, even if water was a problem, and waited there while I continued on to see if the main campsite on the southeast end of the meadow was occupied. Surprisingly, no one was there. This was the same campsite at the trail junction we had occupied so pleasantly for three nights in 1995 on our 9-day hike into the area. We had dayhiked from there to Landers, Horseshoe, and Ward Lakes. I radioed Barbara the good news. Down the trail two-hundred yards, near the Landers Creek crossing, Barbara discovered another tent in a little pocket meadow, but we could not see or hear the occupants from the main campsite. It was extremely hot as we followed a game trail through the brush to Swift Creek to take a dip and cool down. When we returned to camp, a chipmunk scrambled out of my backpack. We shooed it away and tossed rocks when it tried to return. The housing of the water filter had split and developed a leak, which we mended with a tourniquet of yellow duct tape. On a trip to fill the water jug, I encountered a nattily dressed young man wandering up the trail. It was he and his female companion who were camped down by Landers Creek. The man asked a couple of naive questions about the trails to Ward and Landers Lakes that lead me to inquire, "Is this your first wilderness backpack?" "Why yes, how did you know." Later in the afternoon, as we prepared dinner, a pair of young deer wandered into the camp. The heat persisted. As the long shadows began to fall on the meadow, the temperature was still above 80 degrees. After the dishes were cleaned, we hiked a little way up the Ward Lake trail to explore, then lay in the hammocks watching for deer in the meadow. The young man and his companion from the lower camp strolled past. She was plump and wore a bright yellow blouse, baby-blue stretch pants, and a wide, bouncy straw sun hat that would only have looked proper at a garden party. "This is very good news," I whispered. "In case there's any bears." "Yeah, they're sure t'go after her first. Like picking the brightest M&M out of the candy bowl. They can't resist. It'll give us time to get away." We watched the meadow until it grew too dark to see. A few bats fluttered against the dimming sky. Then we sat by the fire relishing our last night in the wilderness. Saturday morning we were in no great hurry to get on the trail. We should have been. The seven miles back to our van descended 1500 feet, but the trail was good and the grade gradual. What we failed to account for was the heat. We recrossed the same streams in our water shoes, meandered alongside Swift Creek, paused to admire patches of Darlingtonia, photographed Swift Creek from the rim of the gorge, and rested for lunch. As our elevation dropped, the temperature rose into the upper eighties or lower nineties in the merciless sun. By afternoon the heat was stifling and our packs had grown ponderous. We sweated out the last mile with rubbery legs on the verge of cramping. At the parking lot we dropped our packs and rolled the van down to a small patch of shade, then sat panting in our lawn chairs as we peeled off our sweaty clothes. What had we learned? That it is a mistake to generalize about a place from a single sampling. Or maybe, to generalize at all is a misrepresentation. A confusion of the map with the terrain. Ego cogito cogitans. As Bob Dylan might have summed it up, "Them ol' thoughts're only in yer head."